This book, written by a lawyer and unique for its perspective based in both legal and social history, illuminates the important role played by the concept of the rule of law in the transformation of New South Wales from a penal colony to a free society. The convicts had first-hand experience of criminal law, but all the settlers were part of a culture that emphasized the rule of law as the guarantee of its fundamental political value, British liberty. Dr. Neal outlines the interaction between law and politics in early New South Wales, where because there were no official political structures, the courts served as a de facto parliament and a means of political expression. 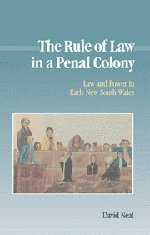 This book, written by a lawyer and unique for its perspective based in both legal and social history, illuminates the important role played by the concept of the rule of law in the transformation of New South Wales from a penal colony to a free society.